In order to guide sentient beings out of their suffering and to realization and liberation, Buddha Tönpa Shenrap emanated countless manifestations of himself throughout all the realms of existence. Although these emanations appeared in different forms according to sentient being’s understanding, his mind remained unchanged. In the Yungdrung Bön tradition, it is believed that until a being reaches that state of buddhahood, they are bound to be reborn again and again throughout the six realms of cyclic existence. These six realms of cyclic existence, or six destinies, are from the lowest to the highest: the hell realm, the hungry ghost realm, the animal realm, the human realm, the demi-god realm and the god realm. (Here, god refers to beings that can have great power and meditative realization but who are still bound by karma.) 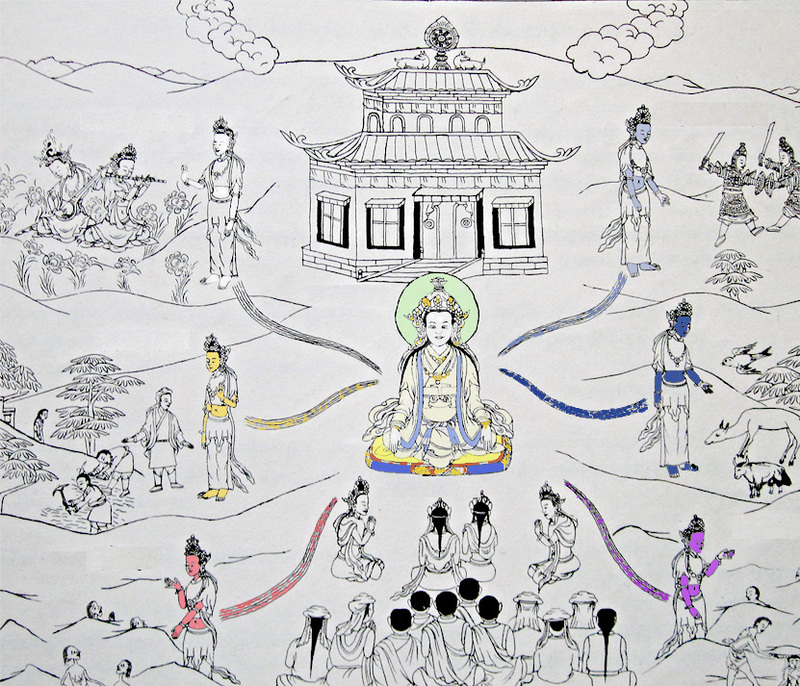 Because of this, the Buddha emanated six enlightened beings from his mind into each of these realms. These six enlightened beings are of one essence but due to the specific suffering and obstacles of the beings within each realm, they each emphasize a particular quality for the predominant suffering related to that realm. Because the predominant suffering related to the hell realm arises from hatred, this Buddha emphasizes teachings of love. Because the predominant suffering related to the hungry ghost realm arises from greed, this Buddha emphasizes teachings of generosity. Because the predominant suffering related to the animal realm arises from ignorance, this Buddha emphasizes teachings of wisdom and awareness. Because the predominant suffering related to the human realm arises from jealousy, this Buddha emphasizes teachings related to openness. Because the predominant suffering related to the demi-god realm arises from pride and envy, this Buddha emphasizes teachings of peacefulness. Because the predominant suffering related to the god realm arises from contentment and laziness, this Buddha emphasizes teachings of diligence. Posted on January 30, 2014, in Tibetan Culture & History, Tonpa Shenrap, Uncategorized and tagged Buddha, Tibetan history, yungdrung bon. Bookmark the permalink. Leave a comment.